To use DDR3 memory, your system must have both a 204-pin SODIMM slot and a chipset that supports DDR3 memory. A DDR3 SODIMM will not fit into DDR2 or DDR memory sockets. 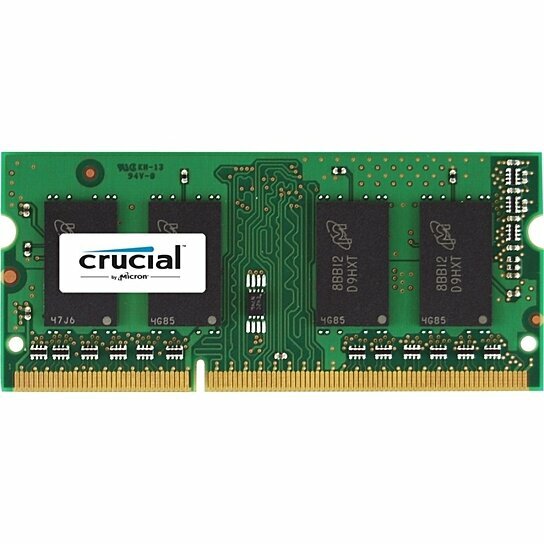 (Information about which memory technology your system uses is included in the Crucial Memory Advisor tool. SODIMMs are smaller and thinner than regular DIMMs, and the 204-pin SODIMM PCBs are always ~2.6 inches long and are usually around 1.18 inches high (though the heights can vary slightly). They consist of a number of memory components (usually black) that are attached to a printed circuit board (usually green). The number of memory components on a 204-pin SODIMM"s printed circuit board (PCB) can vary, but the PCB will always have 102 pins on the front and the back both, for a total of 204 pins. The gold pins on the bottom of the SODIMM provide the connection between the memory module and the memory socket.